Our PICO syringes help you deliver a blood sample with high analytical quality. This is because they contain Radiometer’s uniquely formulated dry, electrolyte-balanced heparin. It prevents clots from forming in the sample and minimizes bias on all electrolytes. PICO50 and PICO70 syringes are available with our unique TIPCAP. 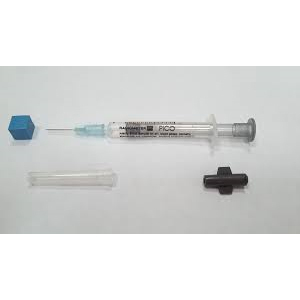 The TIPCAP attaches securely to the syringe to reduce the risk of blood spillage during transport. The standard TIPCAP is designed with air channels that prevent air from entering into the blood sample as the syringe is being sealed. PICO50 aspirator syringes are available with a standard luer tip, allowing the syringes to be attached to the arterial catheder/line.